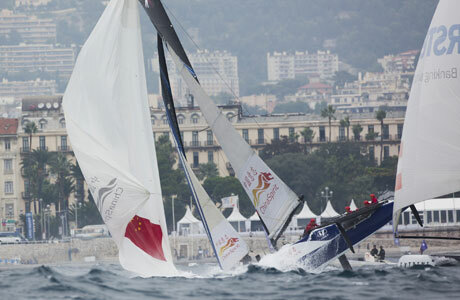 ChinaSpirit, the exclusive Chinese Multiplatform Performance Sailing Team, based in Shanghai, China and endorsed by the Government, proudly represented China at the Extreme Sailing Series in Nice, France, this weekend. ChinaSpirit made history by winning 2 races. 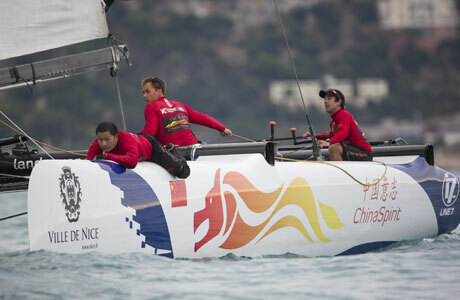 This is the first time that a Chinese sailing team wins in an elite international regatta. ChinaSpirit participated in the Extreme Sailing Series in Nice, France, one of the most respected international sailing series in the world, combining the best skippers on the planet competing on state of the art 40 foot catamarans, the Extreme 40. This is only the 2nd time for ChinaSpirit to participate in the Extreme Sailing Series, compared to most teams who have competed for over a year. So winning 2 races in a row on day 3 and day 4 was a real victory for ChinaSpirit and the start of the vision to “Make History…Again” for China. Winning the last race on day 3 and the first race on day 4 positioned ChinaSpirit with the mainstream teams which have much more experience. ChinaSpirit was able to place in the top 3 in more than 32% of the races (compared to 25% in Cardiff); and top 5 in over 55% of the races (compared to 50% in Cardiff). So a strong improvement for ChinaSpirit compared to their first event one month ago. “Winning not one, but two 2 races, for a new team joining at the end of the Extreme Sailing Series is a testament to the quality of ChinaSpirit and proves that ChinaSpirit has what it takes to compete with the best sailors in the world. Our goal is for China to get excited to watch what a Chinese sailing team can achieve with the right resources and athletes. We want China to start watching and following the progress of their very own sailing team”, says Noëlle Gahan- Smulders, CEO of ChinaSpirit. Noëlle Gahan-Smulders adds “We have three major goals for 2014; one of them is a Recruitment and Training program for young Chinese sailors and athletes – to achieve this goal, ChinaSpirit will need to participate in many international regattas as well as partner with the best sailing academies across the world. The multiplatform format of ChinaSpirit is the ideal path for developing and growing young Chinese sailors to win international regattas. 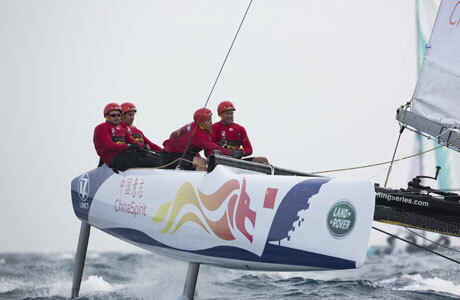 Eventually ChinaSpirit will be manned by mainly Chinese sailors and will win the races”. ChinaSpirit mainsail trimmer William Wu repeated his exploits in Nice and was thrilled to be part of making history for China with the 2 wins and strong results overall: “I hope that China will start watching and following ChinaSpirit as this is really exciting and as we gain more experience and have more Chinese sailors aboard, there is no reason why we should not place in the top 3. I was very happy to see that CCTV was here for 2 days to follow ChinaSpirit and hope that many Chinese people will enjoy watching us on TV and the internet to see what we can do for China and then start supporting our very own sailing team”.